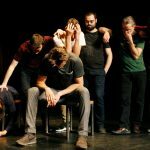 Inspinazie is a 25 year old improvisation theatre company based in Belgium. 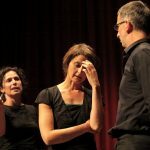 Known for the International Festival Improovelicious, for being pioneer in applied improvisation in Flanders and for the many improvisation theatre classes. Inspinazie has evolved into a house with many rooms, a strong network of people and teams with their own businesses. On the dutch page you can find our complete info and links to all our different rooms. Here we gather the most relevant contact information and blogs for people looking for English spoken or international activities. Don’t hesitate to get in touch! Subscribe to our (dutch) newsletter if you want to be kept updated. All our thematical shows can be booked in English. Inspinazie trainers have great expertise in incompany training. They are involved in the worldwide applied improvisation network. Let us know what you need and we’ll bring you in touch with our best match for your demand! 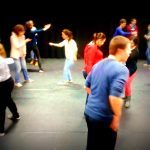 Our improvisation coaches have been and are teaching on many international improvisation festivals. 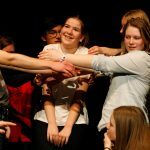 We coach general improvisation classes, and have experts in clowning, forum theatre, Meisner, Viewpoints, movement improvisation, fysical & visual work, music improvisation ,… Get in touch! Get ready for the 10th edition in march 2020!